I have done several nail art tutorial with regular polish as well as with Shellac or gel polish. I received a comment/question on how to correctly remove the gel polish. As a Cosmetologist and Nail Technician I sometimes forget that not every beauty trick I know is common knowledge. I have soaked so many acrylics/gels off of myself and others I can’t even count. 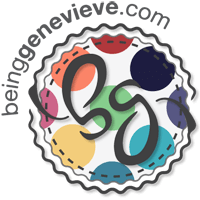 I have tried many methods, but want to share with you the quickest, best, easiest, etc. 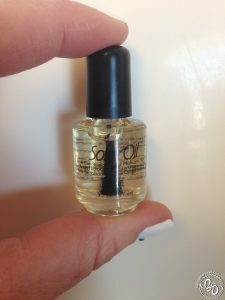 way to soak off your “fake” nails or gel polish. 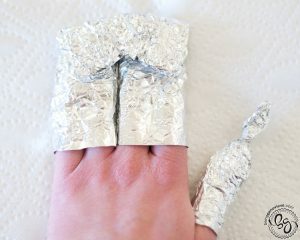 The method I will be using will have you wrapping your nails in foil. 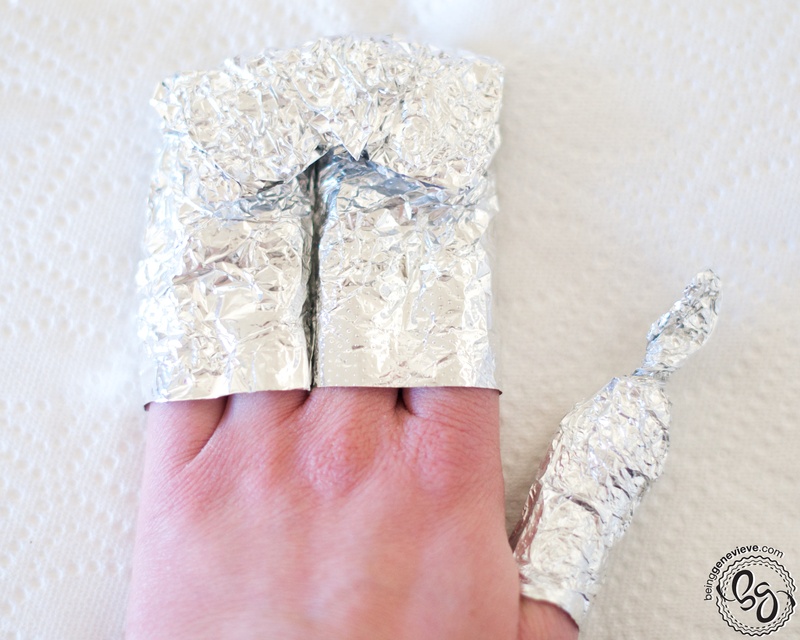 This is because the foil helps trap the heat of your finger in with the acetone. Acetone breaks down gel/acrylics much quicker when warm. The days of soaking your hand in a bowl of cold acetone are gone; Not only is this way damaging to your skin, but acetone will strip all the moisture from your cuticles and skin causing possible hangnails and infection. 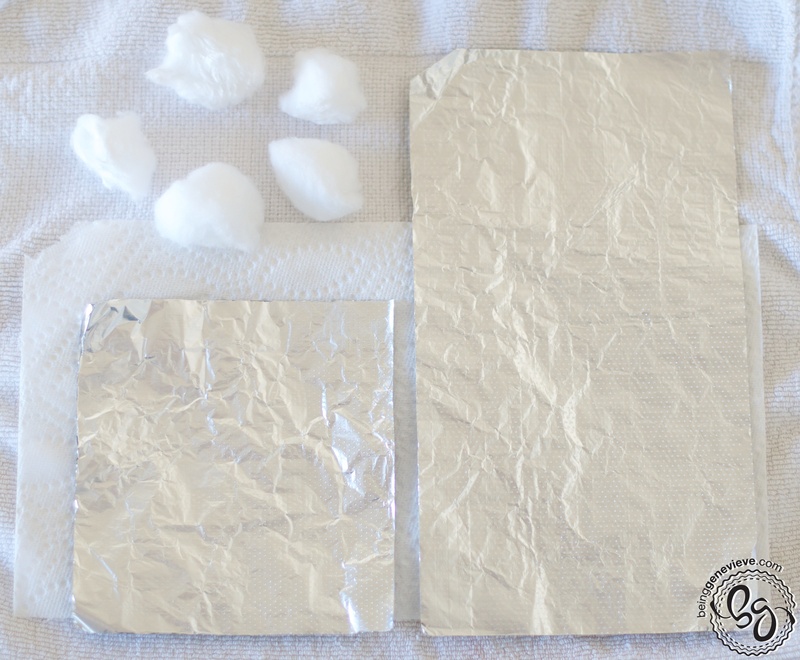 Begin by cutting foil into 4-5″ squares or 5″ x 8″ rectangles, depending on which wrapping method you choose from below. 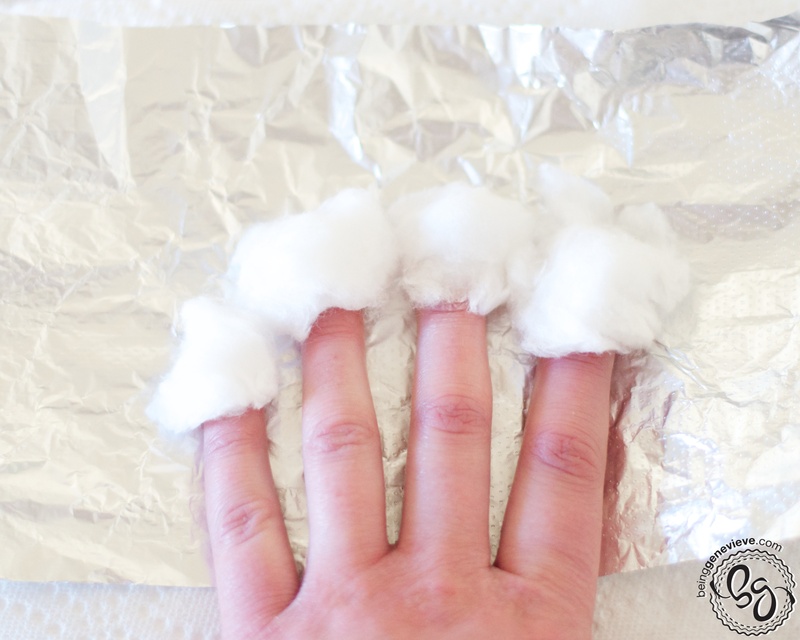 Cut cotton balls into halves or thirds. 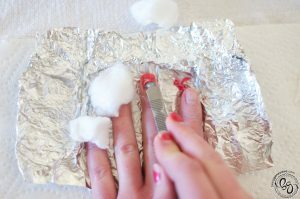 Place foil under nail/hand. 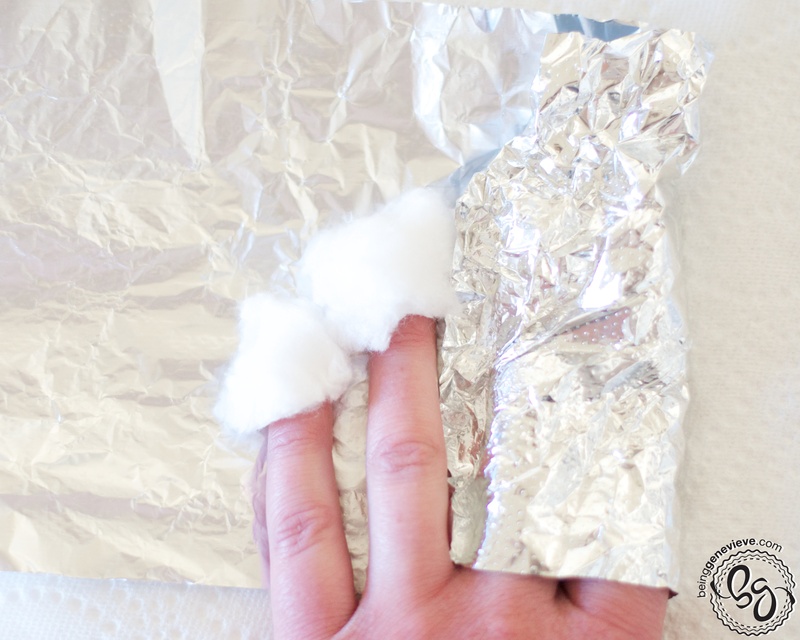 Take cotton ball and dampen with acetone. 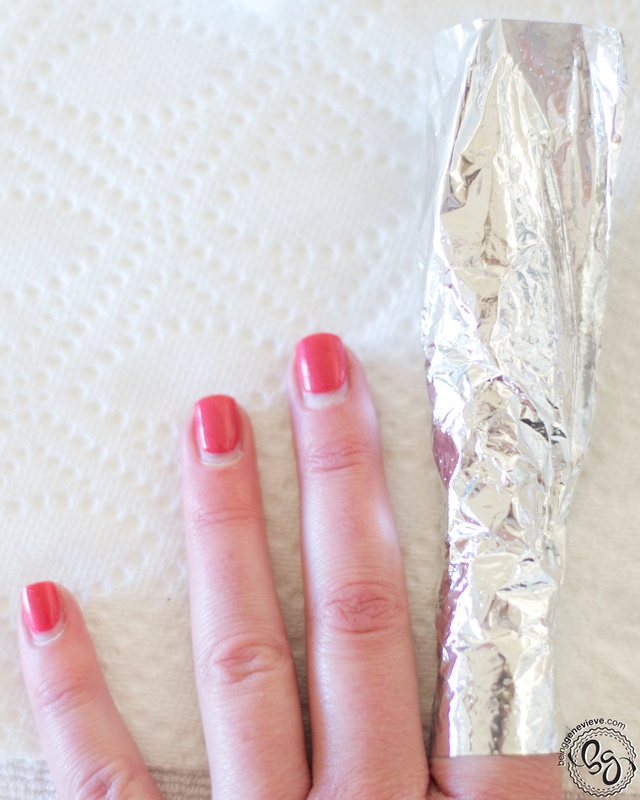 Place directly onto nail polish. 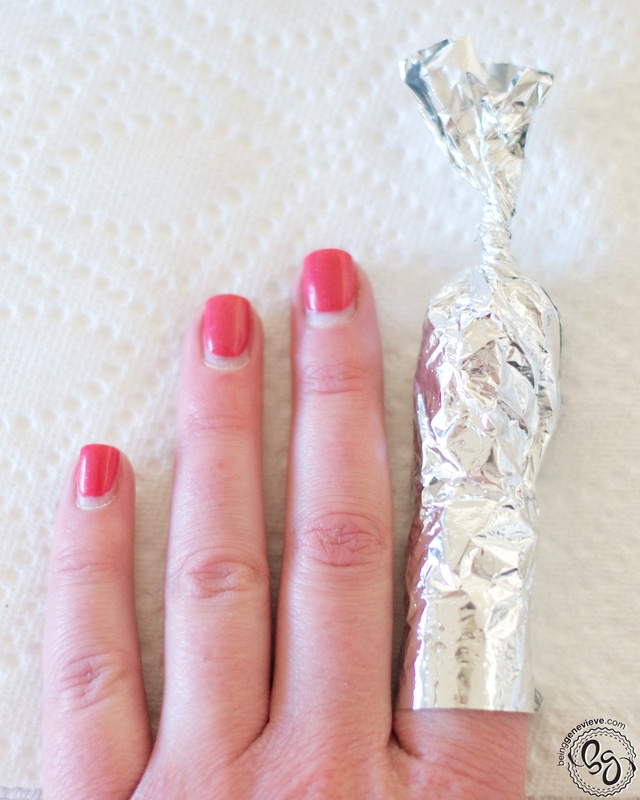 Wrap foil around nail in one of the below methods. 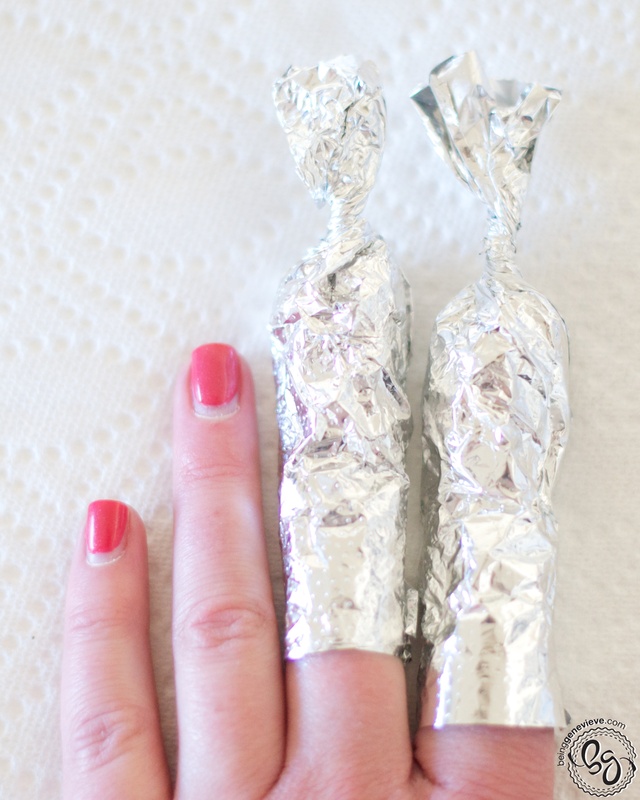 Method 1 – Wrap each finger individually and then twist the top of the foil closed. Method 2 – Wrap four fingers together, fold the top down, and then thumb separately. Let acetone sit on nails for 5 minutes. 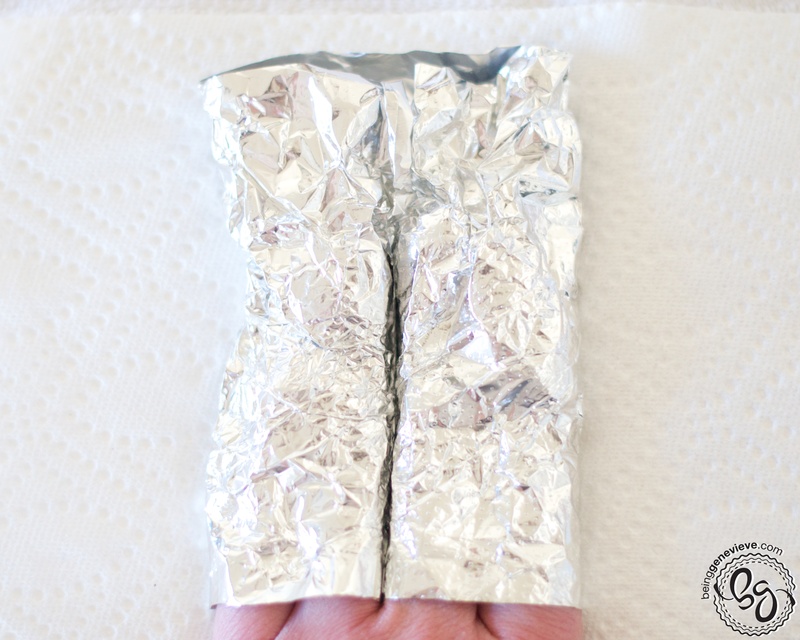 Unwrap the foil and gently scrape off the weakened gel. I use my cuticle pusher, but you can use anything, i.e. popcicle stick, handle of pen or paintbrush, whatever you have lying around. 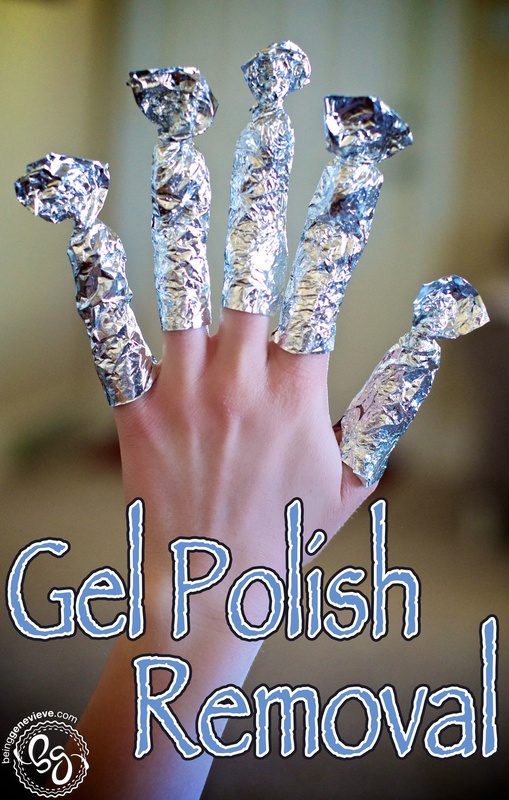 The gel will slide off easily. 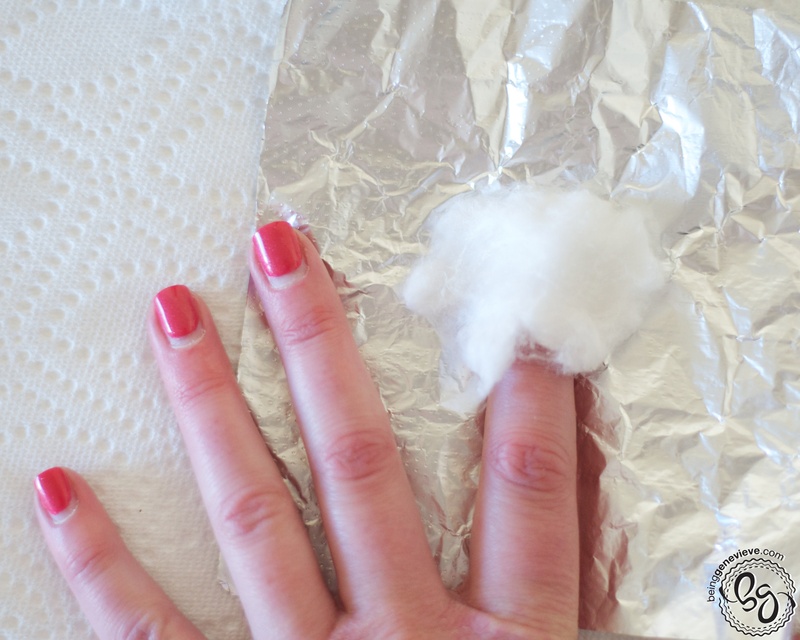 If only part of the gel comes off place the cotton ball back on nail and wrap in the foil for another 3-5 minutes. 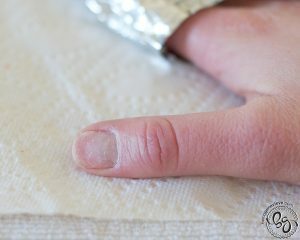 This is a picture that shows how damaging acetone can be to the skin. You can see exactly where the cotton ball was sitting on my skin. 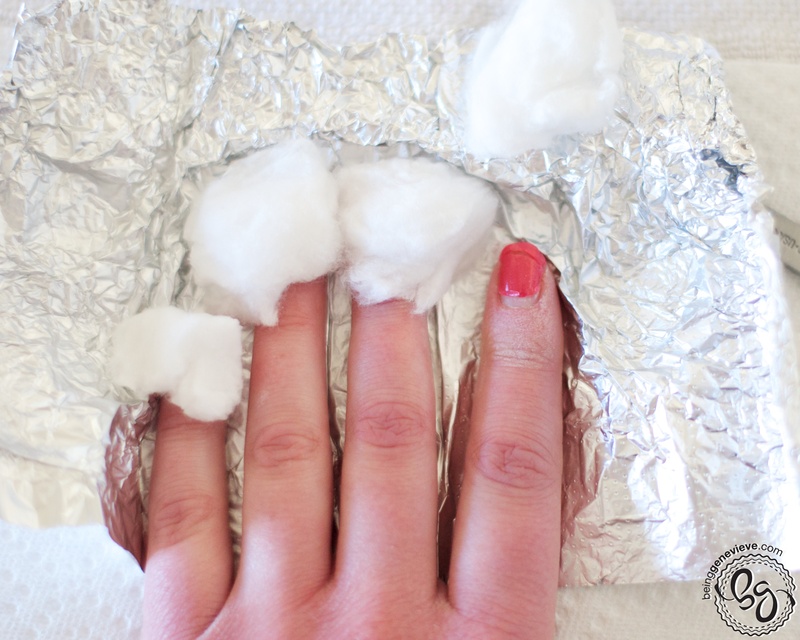 Please don’t soak your hand in a bowl of acetone! Now that the gel/acrylic is all removed you can either paint again with gel polish or use a buffer/shiner to shine the natural nail. Note: Remember to use cuticle oil after you are all done using the acetone to prevent hangnails or excessive dryness. If you have any questions please leave a comment or shoot me an e-mail. Thank you. I just happened to come across your page from one of the other sites I follow makeit-love it.com. I love your nail tutorials. Today is my birthday so I thought that I would go buy some gel polish to try to create your lovely nail art myself. My husband thinks I’m nuts and should just pay someone else to do it. Call me frugal but I find it a waste of money when I can do it myself. When I went into the Sally’s Beauty Supply store there were so many polishes to choose from. I felt so overwhelmed. Which brand do you recommend? Sally Hansen? Essence? What about LED lights? I normally just file my nails and place polish on them but I really want to try new things. Thank you for the comment! I have to admit that I LOVE gel polish. On me, regular nail polish chips within a day or two, but with gel polish I have gone as long as 3 weeks without any chipping or lifting. I have to admit that I have only tried two different gel polish brands: OPI and CND. Out of those two I prefer CND. But to answer your question between Essence and Sally Hansen, I personally prefer Essence over Sally Hansen, for regular nail polish. I have the CND LED light because I use the CND gel polish. I recommend using the LED light that is made/recommended for whatever gel polish brand you choose. For example, if you use CND (Shellac) gel polish with a different brand of LED light it won’t cure correctly every time. 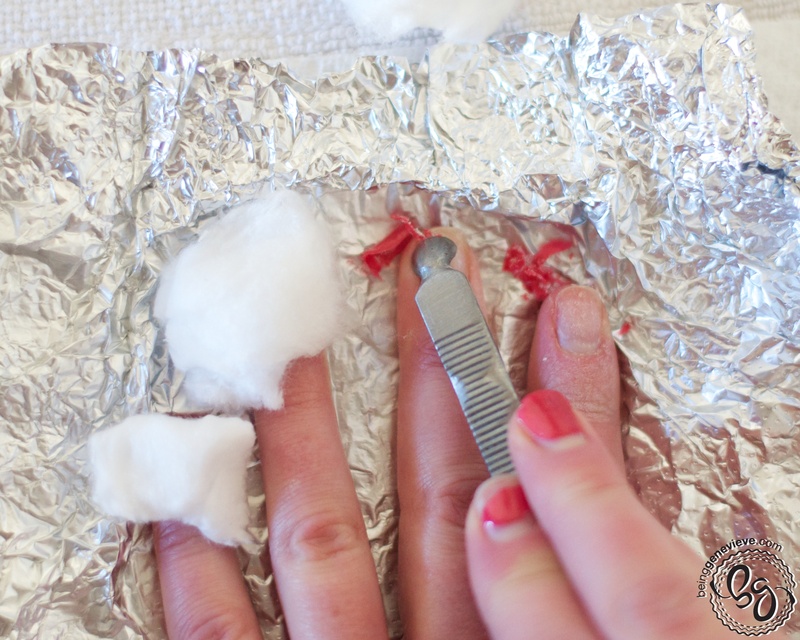 You can get rippling of the nail polish, the polish can slightly running off the nail as it cures causing early lifting of the polish, or just having to increase the cure time to make sure the polish is set up hard enough. Some may say that any LED light will work with any gel polish. Out of personal experience I have to disagree. So pick the LED light that is recommended for the brand of gel polish that you choose, you will have much better results with curing and longer wear without lifting. I hope this was helpful. If I didn’t answer your questions how you were hoping please let me know. If you have any additional questions, please ask! Thank you!